The most common types of arthritis are osteoarthritis and rheumatoid arthritis, but there are actually more than 100 different types of inflammatory arthritis. According to the NIH, in 2012, more than 51 million people suffered from some form of arthritis. According to the Arthritis Foundation, nearly two-thirds of sufferers are under the age of 65. Juvenile arthritis refers to the many degenerative arthritic conditions that affect children. The knee is the largest and strongest joint in your body. It is made up of the lower end of the femur (thighbone), the upper end of the tibia (shinbone), and the patella (kneecap). The ends of the three bones, where they touch, are covered with articular cartilage, a smooth, slippery substance that protects and cushions the bones as you bend and straighten your knee. Two wedge-shaped pieces of cartilage, called a meniscus, act as “shock absorbers” between your thighbone and shinbone. They are tough and rubbery to help cushion the joint and keep it stable. The major types of arthritis that affect the knee are osteoarthritis, rheumatoid arthritis, and post-traumatic arthritis. The most common type of arthritis is osteoarthritis, a progressive disease that slowly wears away joint cartilage. This type of arthritis is often seen after middle age and is referred to as “wear and tear” arthritis. As the protective cartilage is worn away, bone is exposed, the knee becomes swollen and painful, and activities become increasingly painful. This type of arthritis may also have a genetic component as it seems to run in families. Rheumatoid arthritis is an inflammatory disease that can strike at any age. It is often managed conservatively by a rheumatologist, who specializes in the disease. When arthritis develops following an injury to the knee, shoulder, ankle or hip, it is called post-traumatic arthritis. 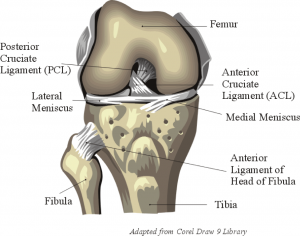 It can occur years after a torn meniscus, injury to a ligament, or fracture of the knee or other joint. A stiff and swollen knee that is difficult to bend and/or straighten. Pain and swelling that is worse in the morning or after periods of sitting or resting. Vigorous activity or long periods of walking may cause pain to flare up. The knee may exhibit “locking” or “sticking” during motion. This is caused by loose bodies that may exist in the knee. The knee may creak, click, snap or make a grinding noise (crepitus). Many people with arthritis note increased joint pain during rainy weather. During your appointment, your doctor will talk with you about your symptoms and medical history, conduct a physical examination, and order imaging such as x-rays. X-rays: These imaging tests create detailed pictures of dense structures, such as bone. They can help distinguish between various forms of arthritis. X-rays of an arthritic knee may show a narrowing of the joint space, changes in the bone, and the formation of bone spurs (osteophytes). Other tests: Occasionally, a magnetic resonance imaging (MRI) scan, a computed tomography (CT) scan, or a bone scan may be needed to determine the condition of the bone and soft tissues of your knee. There is no cure for arthritis, but there are a number of treatments, both surgical and non-surgical, that are effective at relieving the pain and disability it can cause. Some changes in your daily life can protect your knee joint and slow the progress of arthritis. Minimize activities that aggravate the condition such as climbing stairs. Switching from high impact activities (such as jogging or tennis) to lower impact activities (such as swimming or cycling) will put less stress on your knee. Losing weight can reduce stress on the knee-joint resulting in less pain and increased function. Physical therapists can identify exercises that help increase range of motion and flexibility, as well as help strengthen the muscles in your leg. Your therapist can define an individualized exercise program that meets your needs and lifestyle. Using devices such as a cane, wearing shock-absorbing shoes or inserts, or wearing a brace or knee sleeve, can be helpful. A brace assists with stability and function and may be especially helpful if the arthritis is centered on one side of the knee. There are two types of braces that are often used for knee arthritis. An “unloader” brace shifts weight away from the affected portion of the knee, while a “support” brace helps support the entire knee load. Applying heat or ice, using pain-relieving ointments or creams, or wearing elastic bandages to provide support to the knee may provide some relief from pain. Glucosamine and chondroitin sulfate, substances found naturally in joint cartilage, can be taken as dietary supplements. Although patient reports indicate that these supplements may relieve pain, there is no evidence to support the use of glucosamine and chondroitin sulfate to decrease or reverse the progression of arthritis. Several types of drugs are useful in treating arthritis of the knee. NSAIDs, such as ibuprofen and naproxen, are available both over-the-counter and by prescription. A COX-2 inhibitor is a special type of NSAID that may cause fewer gastrointestinal side effects. Common brand names of COX-2 inhibitors include Celebrex (celecoxib) and Mobic (meloxicam, which is a partial COX-2 inhibitor). A COX-2 inhibitor reduces pain and inflammation to increase your function and mobility. If you are taking a COX-2 inhibitor, you should not use a traditional NSAID (prescription or over-the-counter). Be sure to tell your doctor if you have had a heart attack, stroke, angina, blood clot, hypertension or if you are sensitive to aspirin, sulfa drugs, or other NSAIDs. Two types of injections are helpful in relieving the pain of the arthritic knee: Corticosteroids and Viscosupplementation. These injections work in different ways. Corticosteroids (also known as cortisone) are powerful anti-inflammatory agents that can be injected into the joint. These injections provide pain relief and reduce inflammation; however, the effects do not last indefinitely. Your doctor may recommend limiting the number of injections to three or four per year, per joint, due to possible side effects. In some cases, pain and swelling may “flare” immediately after the injection, and the potential exists for long-term joint damage or infection. With frequent repeated injections, or injections over an extended period of time, joint damage can actually increase rather than decrease. Dr. Heekin will recommend surgery if your pain from arthritis causes disability and is not relieved with nonsurgical treatment. As with all surgeries, there are some risks and possible complications with various knee procedures. Your doctor will discuss the possible complications with you before your operation. Arthroscopy: During arthroscopy, doctors use small incisions and thin instruments to diagnose and treat joint problems. Arthroscopic Surgery: This type of surgery is not often used to treat arthritis of the knee. In cases where mild osteoarthritis is accompanied by a degenerative meniscal tear or made worse by loose bodies or bone spurs, arthroscopic surgery may be recommended to treat the other issues. Dr. Heekin will remove the damaged cartilage and bone and then position new metal or plastic joint surfaces to restore function and renew stability and movement. Of all possible surgical interventions, total knee replacement offers the greatest quality of life improvement. The procedure has a high rate of success. After any type of surgery for arthritis of the knee, there is a period of recovery. Recovery time and rehabilitation depend on the type of surgery performed. Dr. Heekin will prescribe physical therapy to help you regain strength in your knee and to restore range of motion. Depending upon your procedure, you may need to wear a knee brace or use crutches or a cane for a period of time.